The green bag with the traditional company designed checked pattern at the top followed by the company branded name below, works very well. The flavor is a little lost in the messy photographic image and the typed message declaring that there are 'No Preservatives' is as dated at the 'Potato Chips' font. No mention of the 'Kettle Cooked' nature of the Chips denies Dieffenbach's the advertisement of what is considered a premium style of Chip. If the company wanted to reach out further than local stores and regional shops, these bags could do with an update. Extra thick, Rippled Chips with wide canyons of Ridges, made these more crunchy than most Chips. The curved ones allowed one at a time bites of thick and firm crunchiness. Ridged Chips invariably provide a thicker slice of potato. As these were Kettle Cooked they are extra thick. There are visible flecks of seasoning and they do appear particularly greasy, so a certain amount of crispy residue was left on fingers. The hand seasoning of these Chips meant a sporadic and sometimes liberal coating of seasoning. This in turn meant different Chips had different quantities of seasoning, which, for us at least, is always a positive. 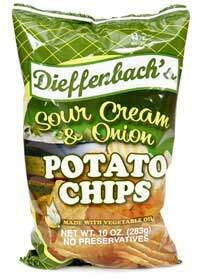 There was undoubtedly a creamy side to the onion flavor, but the overriding taste was that of a sweet and mild onion.